Loved for its yellow, summer flowers and hands-off care, Sedum ‘Angelina’ is a popular low-water pick. Its blue-green leaves grow rapidly with minimal water. Plant 9 to 12 inches apart as a lawn replacement. 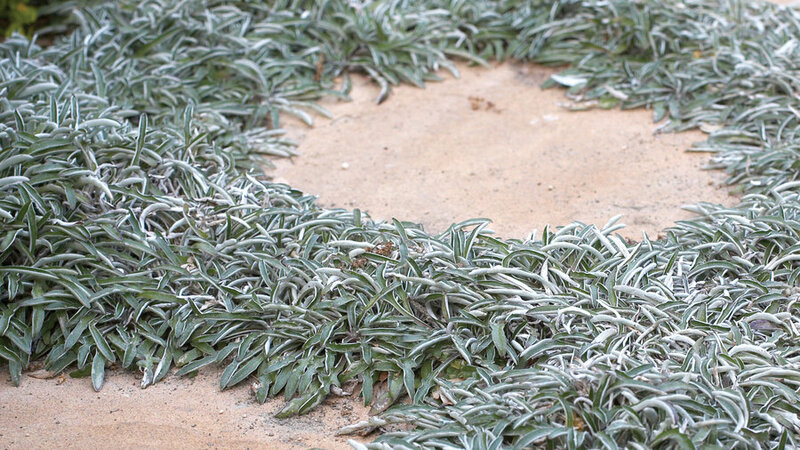 Like other groundcover succulents, it’s delicate, so plant far from romping feet. 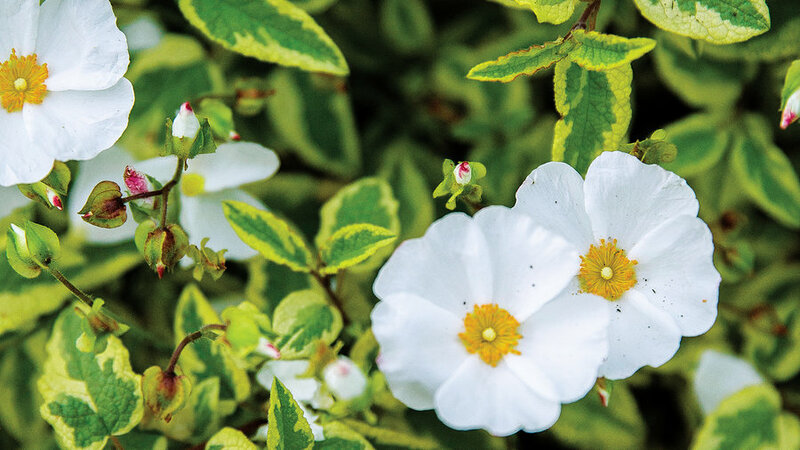 While it’s primarily seen as a squared shrub, this evergreen groundcover can easily cover an entire lawn. Its white flowers entice butterflies from spring through early summer. 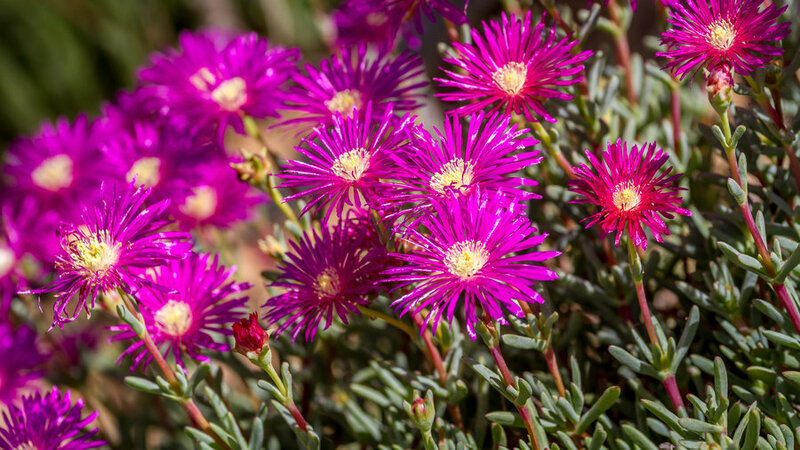 Incredibly drought-tolerant, this plant requires little to no water hence why it’s often grown in fire-hazard areas in need of erosion control. This dense mat calls for little water, and attracts an abundance of bees and beneficial bugs. 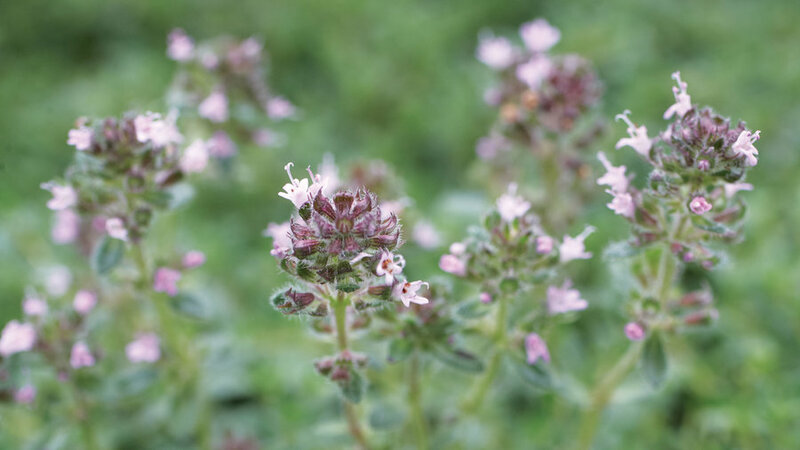 Its pink flowers and edible leaves grow no higher than three inches, making a perfect, groundcover in between steps and along pathways. 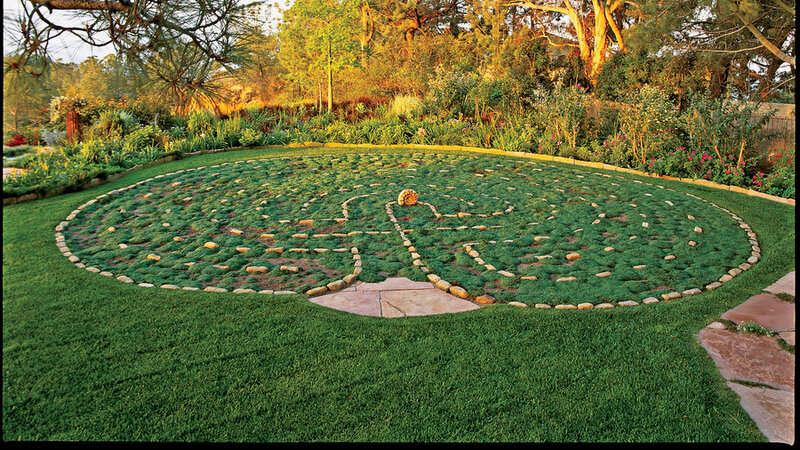 This stepable groundcover is perfect for planting in between stones. Its gray-green leaves can thrive under light foot traffic with moderate watering, and grow no higher than three inches. For best results, plant in dry, rocky soil. Bursting with purple and blue blooms, this California native is a durable groundcover particularly among coastal climates. 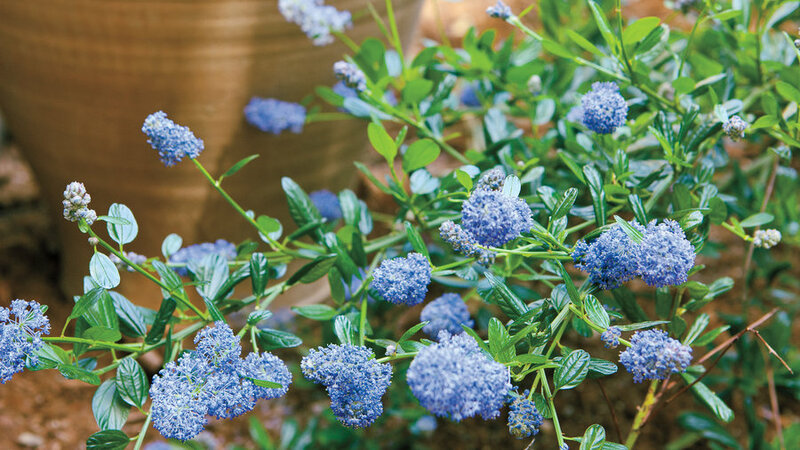 Growing up to three feet high and ten feet wide, Ceanothus is a drought-friendly lawn alternative with sparse water needs. Inland residents should plant in partial shade. 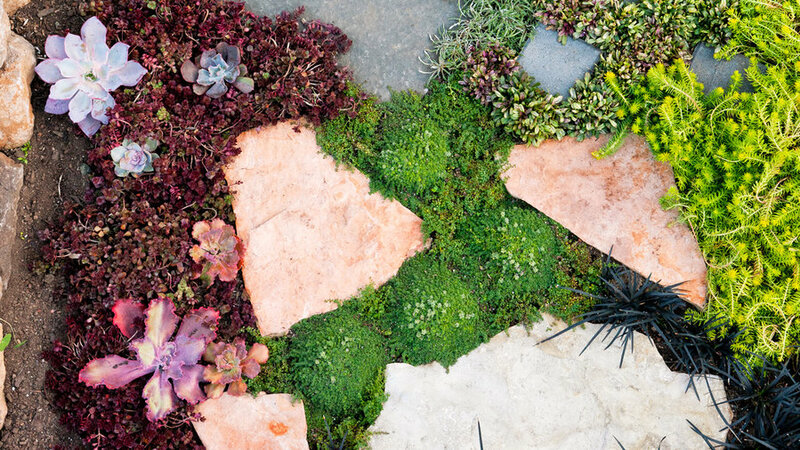 Those looking for an unconventional groundcover will appreciate this succulent’s deep color and low-maintenance care. These red crawlers stretch across a few feet and create an attractive frame, but are easily crushed, so watch your step. 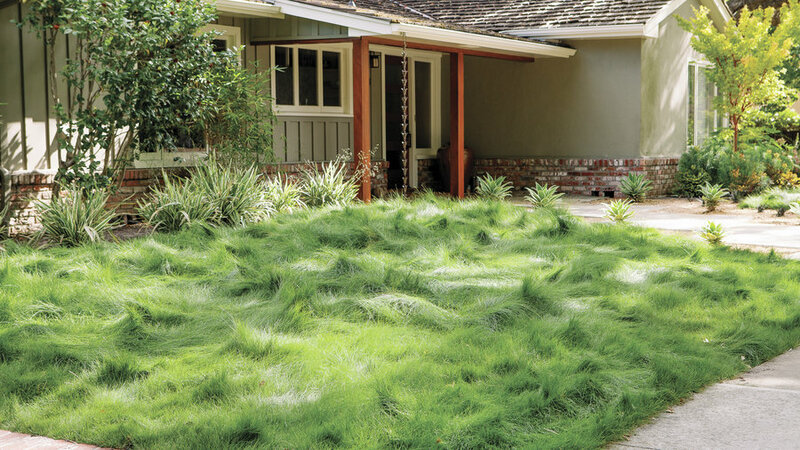 One of many drought-tolerant grasses, this clumping perennial produces neat mounds of fine leaves. It also lends a hand to sloped yards in need of erosion control. Its mounding varieties grow up to 24 inches high, and are generally maintenance free aside from an annual spring ranking. Aromatic and edible, this stepable groundcover is a treat for the senses. Homeowners looking for a colorful lawn substitute can plant starters 1 ft. apart, water moderately, and mow occasionally. When left to bloom its daisy-like flowers can be steeped in tea. For minimal grooming, try the flowerless variety ‘Treneague’ fitting for large spaces and between permeable pavement. It’s no wonder this bee magnet is loved by a wide range of gardeners. Between its beautiful blossoms and minimal watering needs, creeping thyme raises the bar for lawn replacements. Plant ‘Creeping Pink’ or ‘Coccinem’ when covering large plots, and ‘Pink Chintz or ‘Minus’ (shown in photograph) in between steppingstones. Kin to the Sedum ‘Angelina’, this soft succulent bares a similar spiny structure, but boasts a blue-green tone. It thrives in full sun or part shade, and grows up to 16 inches high. 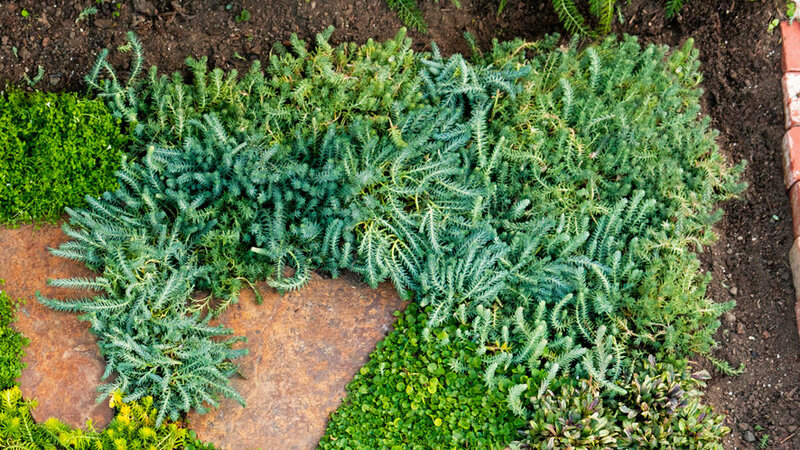 Sedum ‘Blue Spruce’ crawls, so plant 9-12 inches a part along pathways as a full groundcover or in between steps. Also known as Creeping St. John’s Wort, this bursting groundcover spreads fast with its hearty underground stems. Favored for its deer resistance and moderate water needs, it serves as a lawn alternative. 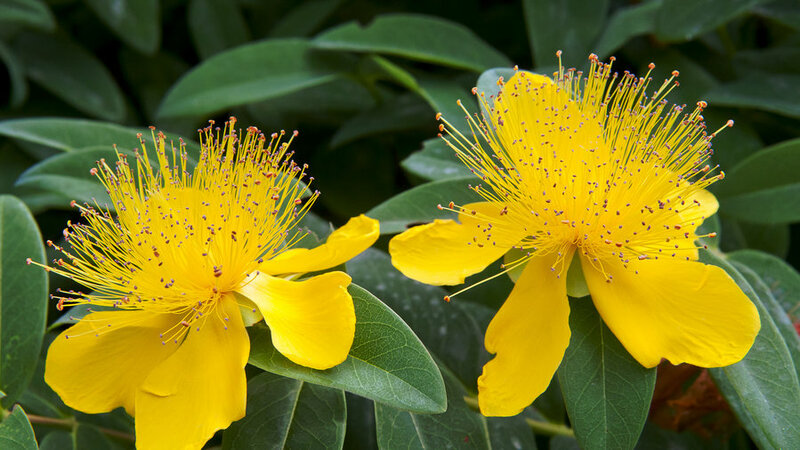 Hypericum calycinum produces yellow blooms in the summer and stretches up 12 inches high. Plant 1 ½ ft. a part, but avoid sowing alongside other beds–this one easily oversteps its boundaries. Incredibly drought tolerant, this succulent perennial requires little to no water and thrives with nominal maintenance. Its pale pink flowers are often seen in coastal gardens, growing up to 6 inches high. 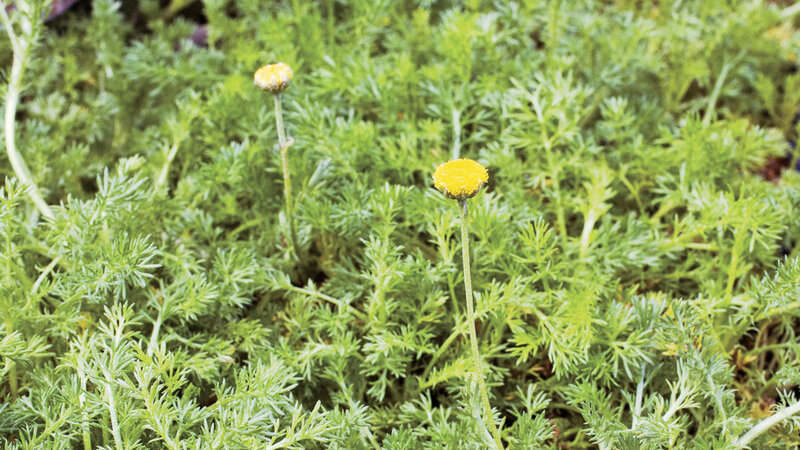 While they're not particularly stepable, these fleshy plants serve as a fitting, water wise lawn alternative.